Ah, minimal effort and no money, was there ever a sweeter combination? Bacon and honey comes pretty close (“Everything is better with bacon and honey. Even bacon. Or honey!” my now-vegan brother used to say and I’m pretty sure he still stands by it) but the relevance of either bacon or honey to language learning has not been proven to date, so we’ll circle back to minimal effort and no money. If you can already read the alphabet, change language settings to your target language on all devices and websites you use often. #Lifehack: if you’re not completely fluent, remember how to change the language settings back to your native language if you ever need to change something you don’t regularly do, or you’ll be trying to figure out how to change the privacy settings on your Facebook photos in Latin and believe me, never has ‘mihi placet’ been more mistaken and unhelpful. Change your homepage to a website in your target language, ideally about a topic you enjoy. Whatever that topic is. No judgement. I tried to be classy and changed my home page to the Brazilian daily newspaper Folha De S.Paulo. After a month of reading zero articles I took a long, hard look at myself and changed my homepage to Cosmopolitan Brasil (yup, really) and I haven’t looked back since. It also came with the added bonus that I’m now in the know about which hairstyles (the long bob is easy and timeless!) are trendy in Brazil. Use Wikipedia’s random article generator (available in all of Wikipedia’s languages!) to get a fresh article about a random topic. When I used it, I learned fun facts about the Acherontia atropos, the Monrovia Transit Authority, Mazuposhteh, Polish footballer Kamil Lech, and the list goes on. If facts about the Acherontia atropos are not your cup of tea (this is a hypothetical example of course, as this bad boy is notorious for a vaguely skull-shaped pattern on the thorax and is the most widely known of the three species of death’s-head hawkmoth, so why are you not reading up on this champ already? ), you quickly click the “random article” button again and a new wealth of information instantly appears. Bonus points if you combine tip 3 and 4 and make Wikipedia’s random article generator your homepage! These are just a few ideas and I’m sure there are many more. 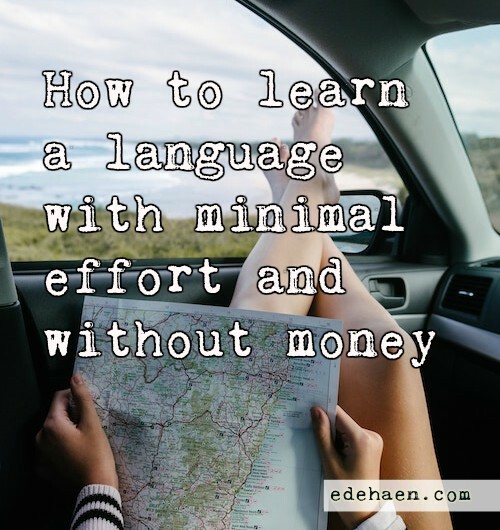 Most importantly, make language learning your easy default option so it’s easier to persevere when the going gets tough. Most people give up on their New Year’s resolutions by the second Friday in January, so the fact that you’ve statistically given up on going to the gym by now should give you plenty of time to refresh Wikipedia!